Green smoothies are all the rage. 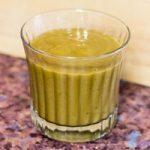 But I’ve just not developed a taste for kale, spinach, broccoli or any other green vegetable in my smoothies and prefer to stick to my fruit concoctions. A banana is a great start to the day. In recent years, bananas have received some bad press because they do not score as low on the Glycaemic Index (GI) as many other fruits and vegetables. But, as this really excellent guide explains, there are weaknesses in using the GI to assess food – you have to eat a lot more of some foods to hit the 50 grams of digestible carbs on which the score is calculated than you do for others – although bananas have a GI score of around 50 (depending on ripeness) you’d need to eat 3 bananas to hit that 50 grams of digestible carbs. It’s also worth remembering that the GI doesn’t take into account the nutritional benefits (or lack of them) of different types of food – crisps are only a touch higher than bananas in terms of their GI score! A banana for breakfast not only keeps me feeling full for quite a few hours, it is also a good source of fibre, potassium, magnesium and vitamins C and B6. Recently I’ve been drinking even more matcha than usual, after writing an article all about it for a recent issue of Good Things magazine. Although the method of grinding tea leaves into a powder originated in China, it was not until the practice reached Japan by way of Zen Buddhist monks that it developed into the drink we know today. Matcha is traditionally made by stone grinding green leaves of shade-grown tea (gyokuro). Before grinding the leaves are dried, de-veined and de-stemmed, in this state they are known as tencha. Growing tea in shade slows down the growth, stimulating an increase in chlorophyll levels. This turns the leaves a darker shade of green and causes the production of amino acids, in particular L-Theanine, which provides a distinctive umami flavour. L-Theanine is also claimed to reduce stress, sharpen cognitive performance and improve mood, especially when combined with caffeine, as it is in matcha. Prunes – dried plums – have long been used as a mild natural laxative, although there’s no real evidence that they’re any more effective than other fruits and vegetables that are good sources of dietary fibre, bananas included. But I love their rich flavour, and they’re a great natural sweetener. 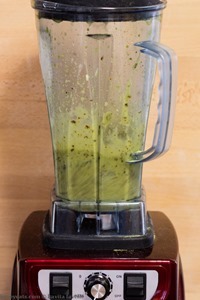 Of course, the dark colour of prunes turns what would otherwise be a brighter green smoothie into a less visually attractive brown one, so feel to substitute with dried dates or apricots, or a generous squirt of honey or maple syrup, each of which will create a quite different flavour profile for your 3 ingredient smoothie. Substitute the prunes with dried dates, dried apricots, honey or maple syrup if preferred. 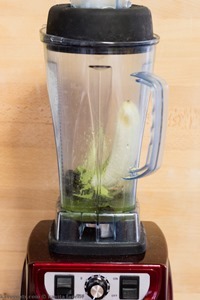 Tip: My Froothie Optimum power blender makes quick work of even the toughest dried fruits, but if yours is not as effective, soak the dried fruits in water for 30 minutes before blending – you can use the soaking water in the smoothie too. 30 Comments to "3 Ingredient Smoothie | Banana, Matcha & Prune"
Thanks, yes I’ve never been able to make myself drink things that are healthy but taste like pond scum! This tastes fab!! I would normally use dates in smoothies so I am glad to find new things to use like prunes. Dates are fab too, even sweeter and paler colour. Prunes have rich distinct flavour but darker. Mmm sounds lovely! I much prefer fruit based concoctions too. Thanks for sharing the link to my own fruity breakfast smoothie! You’re welcome, nice to share lovely recipes! Oh, that’s an interesting one! It just works so well in smoothies! Your smoothie is an original ideal. Love matcha tea! I really need to get me some matcha! This looks lovely. Thanks Kate, I love matcha! Great point about the GI! I am not a banana fan, even knowing how good they are for you, but in smoothies they are great! Yes they’re a perfect smoothie base! I agree. This green smoothie sounds much better that one with kale! Thanks, I’ve really developed a fondness for kale! Wow, this sounds amazing! I would never have thought of this combination and I am very happy to be introduced to it. Lovely! I really must make more smoothies – love this combo of ingredients! Thanks Jan, it’s a very simple but tasty combo! I bet this is amazingly delicious! These ingredients sound wonderful. 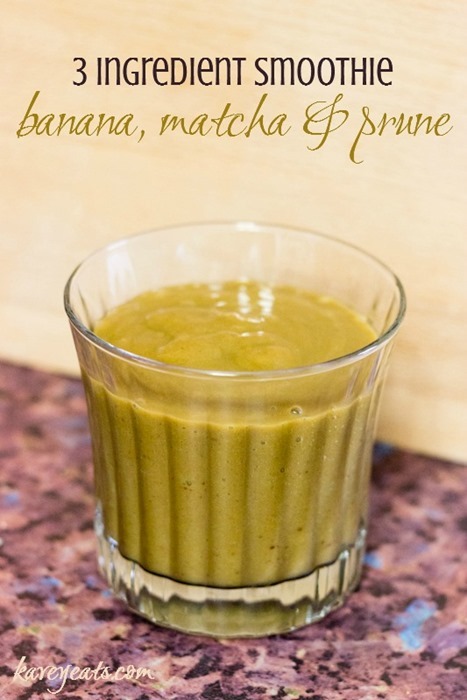 Prunes are so nicely sweet, and bananas are creamy and wonderful, while the matcha powder must be the perfect balance! Yum! Green tea powder IS natural, it consists of tea leaves picked, dried and ground to a powder. I have never used matcha in a smoothie before, but it’s definitely something I am going to try. It’s delicious! Hope you like it too!